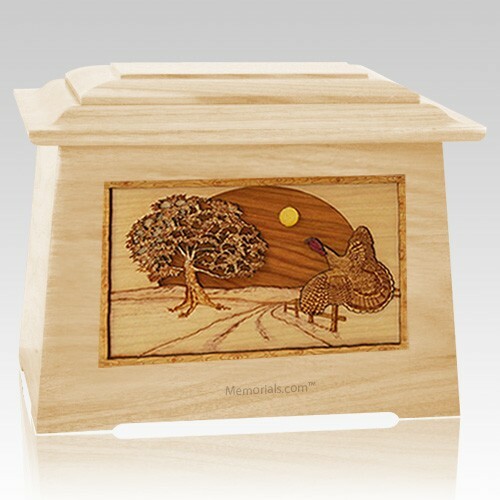 The Turkey Aristocrat Cremation Urn is made from maple wood and finely crafted pieces featuring a breathtaking, realistic nature scene, expertly carved into three dimensions using up to 7 kinds of wood. There is no paint on this urn. This will be a beautiful family heirloom for generations to come. It is master crafted in the United States by some of the most talented woodworkers in the nation. "I really enjoyed the customer service I received. I felt like I was the only customer. I love the urn, the quality is excellent. The purchase price and quality of the urn I purchased can't be beat! My father now has a wonderful place to rest, and that is peace in itself. Customer service was excellent and everything arrived just as promised. Thanks again and Keep up the GOOD Work"